This marker notes the location of the death of a wealthy Mexican merchant. His death caused an international incident. Detailed directions to get to the old Santa Fe Trail location are available. The story of wealth buried at the old Jarvis Creek crossing in early trail days has caused dozens to search for it, and some of these attempts have been remembered by residents of the vicinity. The Jarvis creek legend is uudoubtedly an outgrowth of the murder at that point of a Spanish trader named Chavez, early in 1843. In fact the name of the stream, now given on all maps as "Jarvis" is most certainly a corruption of the trader's Spanish cognomen by the county's earliest settlers who found it a bit hard to pronounce. Don Antonio Jose Chavez, this is the man's name in full. He was a resident of New Mexico and had been plying the trail between the far southwest and the city of St. Louis. Reports circulated in 1842 to the effect that Texan forces were planning to attack traders along the trail were not heeded by Chavez who started out in February of the following year with two wagons, five servants, fifty-five mules and several bales of furs as well as $12,000 in gold and silver. His destination was Independence, Missouri. The spring of 1843 proved unusually cold, which brought inconvenience and hardship to Chavez and his men and death to fifty of the mules they had brought with them. It was on April 10 that Chavez camped at the crossing of the Little Arkansas River in what is now eastern Rice County. Here he was met by a company of 15 men under the leadership of a John McDaniel. McDaniel had organized the band on the frontier of Missouri, expecting to join a Colonel Warfield who was on the plains claiming to be a part of the forces of the Texas Republic and intending to attack trail caravans. Chavez was apprehended by the McDaniel men and taken off the trail to be robbed of his belongings. Seven of the bandits returned immediately to Missouri with their shares of the loot while the balance remained, deciding to dispose of Chavez. They led him to Jarvis Creek where, according to present beliefs, they took him to a ravine which empties into that little stream, and there shot him. With the balance of the spoils they, too, returned to Missouri. Several of the McDaniel gang were afterward arrested by Missouri authorities for implication in the crime and altho some of the guilty escaped, the leader, John McDaniel, was tried and convicted at St. Louis, and put to death. During the trial evidence was produced by the prosecution showing that the wagons belonging to Chavez had been discovered in the ravine near the crossing where they had been left by the murderers. In 1998, at the request of Don and Lillian Swink, the Wet/Dry Routes Chapter assisted in placing a marker at the Jarvis Creek Crossing in Rice County, Kansas. The Swicks have long been interested in marking this site on their property southeast of Lyons which is associated with the murder of Antonio Jose Chavez in April of 1843. A single word inscribed on a limestone post reads: "CHAVEZ"
In the years after 1843, Owl Creek took the name of the man who had died there. But that name, so unfamiliar to frontier folk knowing no Spanish, became hopelessly mangled, Chavis, Chauvey, Charvix, Garvis, Jarvis, and so on. But at last Jarvis was settled upon and by that name is the creek shown on all maps today. Sometime after the murder, relatives or friends of the victim coming from New Mexico paused long enough to erect a marker in his memory at the approximate site of the tragedy. This could have been Don Antonio's brother Jose who is known to have made almost yearly crossings to Independence and Westport during the latter 1840s and early 1850s. Or the marker could have been installed afterward by nephews who inherited the family freighting business. Whoever assumed the task would have had to expend more than casual effort. A pioneer homesteader in remembering it, described the marker as a shaft of solid rock some seven or eight feet tall to two feet wide which was situated near the center of the north line of Section 2, Township 20, Range 7 West. Carved upon its face was the single word "Chavez." The nearest stone suitable for quarrying such a piece lay ten miles to the east on bluffs overlooking the Little Arkansas. 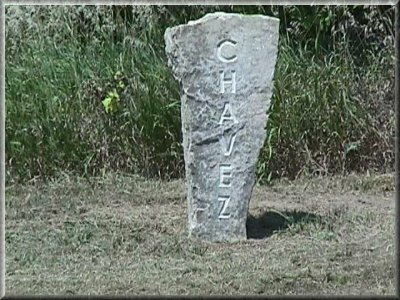 It has also been speculated that the Chavez Monument may now be in the foundation of some farm building in the area, with its inscription turned out of sight. This is just another of the many "Unsolved Mysteries" of the Santa Fe Trail! This information comes from a scrapbook of undated clippings titled "Rice County Clippings, 1876-1955", vol. 1-2 p. 101, Kansas State Historical Society, Topeka; Horace Jones, Up from the Sod (Lyons, Kansas: Rice County Historical Society, 1968) 169-170.